In 1974 when I was 15 years old , I painted this picture. I first did it on a small canvas and then my teacher and I got so excited about it, that we decided to make it the year end project, which we all had to do. I asked my dad to help me build a canvas approximately 4ft x 4ft. It was a big undertaking but I remember being excited about it, and for a change my dad and I spent some time together. This photo was proudly displayed in our rec room, ok maybe it was more like a storage /ping pong room, but still it was hung in our home. My mom was nice about things like that, she had a few pieces that were created by her kids. Mine of course was the largest...so... maybe I was the favorite....no, we were all mom's favorite! Anyway as we got older the jokes started coming out about my painting. Now remember I was only 15 and I still think, for a 15 year old (who never had a lesson) it wasn't that bad. The joke was mostly about the road that lead no where. After my parents died and my brothers were cleaning out our old farm house, I received this one day. The big moving truck came out and brought my HOPE CHEST (which was one of my real treasures from my childhood) and then they brought out this painting. I don't even want to know how much they paid to have it sent to me from West Virginia. What was I suppose to do with it? It was a nice jester, I think my brother thought it meant a lot to me so ..... here it is sitting in my garage, I tried to sell it but haven't had any luck so far. My entry tonight is not to debate whether this picture is worth something or not, but actually to let you know what I was thinking when I painted it. I was 15 at the time, still living with at home on the same property as my grandmother and grandfather. I had been abused by my grandfather since I was 5 years old, home was not a safe place for me. Quite the opposite, I was always looking over my shoulder, wondering if I heard the door open, watching out the window to see where my grandfather was or was not. Every child that comes from an abusive past has to deal with it some how. My survival technique was my art work. I had always loved drawing and creating since I was a little girl but now in Junior High, I had a teacher that I liked and someone else who was passionate about art too. I loved painting, what a fun way to escape to another world, a world that I completely created myself. When I started this painting, I thought it would be neat to go down a road different from others, start anew as they say. I wanted something different than what I was experiencing in my life. I wanted to have a family that was different, a home that was safe, and all I knew is that I would probably have to go down a different road and probably would have to go down it alone. We had a big apple tree on our property and there was a little dirt road beside it, that is where I got the idea from...something I looked at every day. Abuse changes how you view the world, I wanted something different and better and even though it sounds corny, when I look at my painting it is bitter/sweet. I see something that reminds me of my past and all the junk that came with it, but I also see a chance for change and that is exactly what I had to do...go down a different road and much of that I had to do alone. Ok, ok back to my point. I think I should call this painting THE ROAD LESS TRAVELED vs THE ROAD THAT GOES NO WHERE, I am not sure if that having a different name will help it sell any better or not? But it does stand as a great reminder to me, that I did take the road less traveled and my life has been much happier, safer and successful because of it. So go ahead, don't always follow the crowd. Take a look at the road you are on and see where it is leading you? 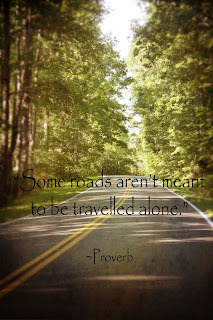 You might have to take a different road, one less traveled but...that's ok sometimes. You can't predict, you can prepare. Experience the power of making decisions based on security instead of worry, readiness instead of reluctance, abundance instead of lack.